This aerial shot taken by Eddie Motta, July 5, 1961 in New Bedford, Mass. Photos and comments by Eric Beheim. "It was my understanding that Ronnie came to the show via Eastern States Exposition. 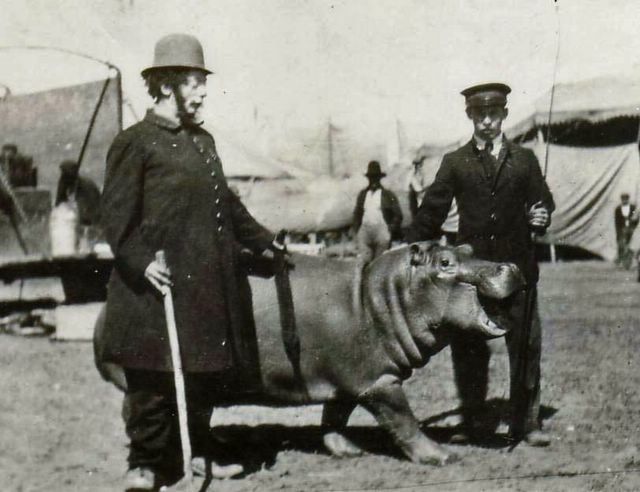 He took his job with Ringling very seriously and expected the local musucians who were hired in each town to do the same. 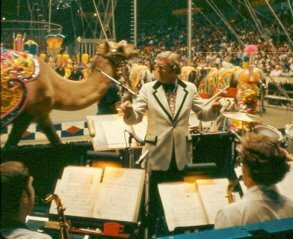 Under his baton, the musical tempos were faster than those of any other of the Ringling bandleaders I worked for. 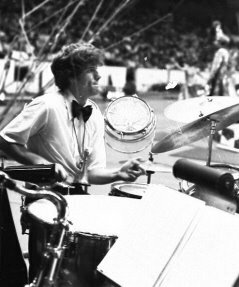 In 1980 (the last year he led the band in San Diego and at the time when Charly Baumann was away in Australia) he seemed much more relaxed and the tempo's weren't quite so fast." 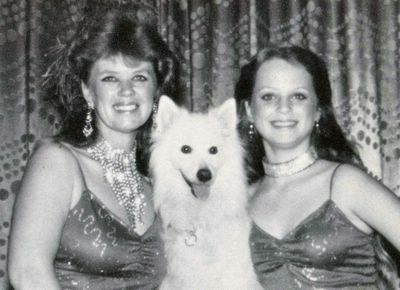 "Ronnie's wife Beverly (shown with Donna Gautier) traveled with him and eventually got a job in the Wardrobe Department. When I took this picture of them in Anaheim in 1980, she had just finished baking a cake for someone's birthday." "Ronnie's son Ricky was the drummer on tour when the Blue Show played San Diego in 1978. I believe that Ricky's wife was the Blue Unit's school teacher that year. (Maybe Shannon and Dalilah can confirm this.)" 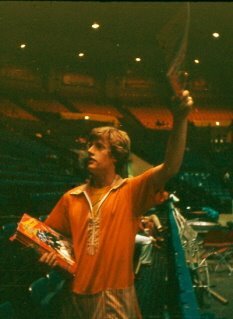 "In 1980, another Drumm son (whose name escapes me) was on the show selling programs. 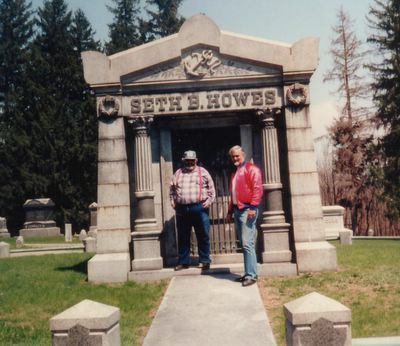 I understand that he was something of an entrepreneur and had several other program sellers working for him." This interesting picture taken by Jimmy Cole in 1969 shows "Toby", Topsy" and "Eva" at the Mid- South Fair in Memphis after the Baraboo Museum had closed for the season. 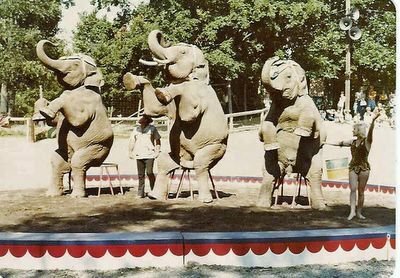 Actually the elephants had already been sold to the Ringling Show and John said that he was contacted by Allen Bloom and asked if on their way to Venice, could they swing by NYC and put the elephants and ponies in the Macy's Thanksgiving Day Parade. This is great story if we can get John to tell it. 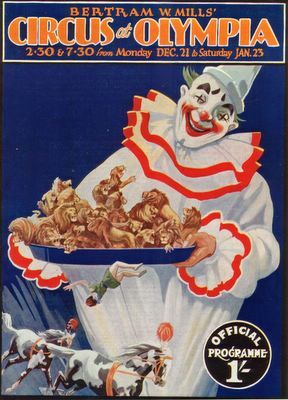 I would imagine this is the Gil Gray Circus. 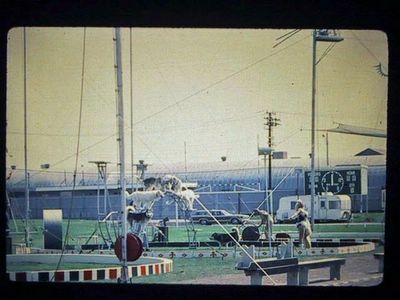 Look at size of those props, the barrell at left, high wire in the background and the archway for the dog seats. These pictures with the black border came from Wayne Jackson for identification who said they were taken by Toby Styles in 1971 at an unknown Ball Park Show. 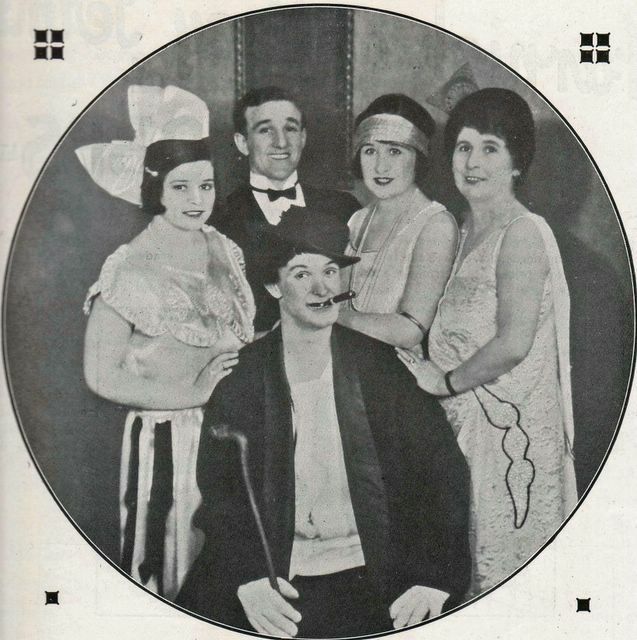 The is Gee Gee Engesser again with "Roxy", "Schell" and "Zola". Isn't that Bill Johnston at left? Looks a bit like Bucky at right. This might be the Bobby Steele bears. This was obviously taken in Baraboo in the mid 1980's about the same time we were there with our elephants. 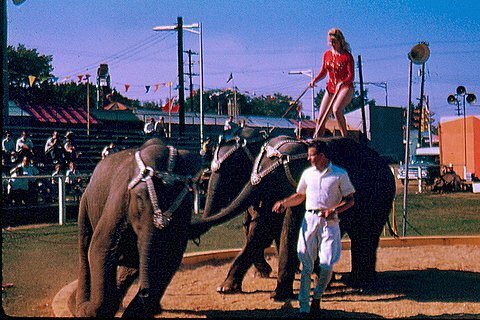 Twenty years earlier I was visiting Hugo Schmitt on the Ringling Show in Anaheim when Jack Joyce hurriedly came out to the elephant tent and announced that the opening animal display would would be eliminated from the next performance saying "The Lion Lady is gone!". Ada, Klaus and his comedy lion had defected. The bill crew looks mighty proud of this stand of paper. 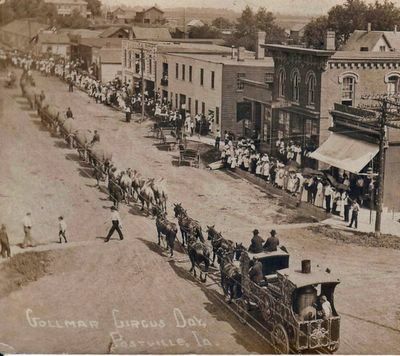 As is known, the Gollmars were first cousins of the Ringlings and also wintered inBaraboo, Wis. 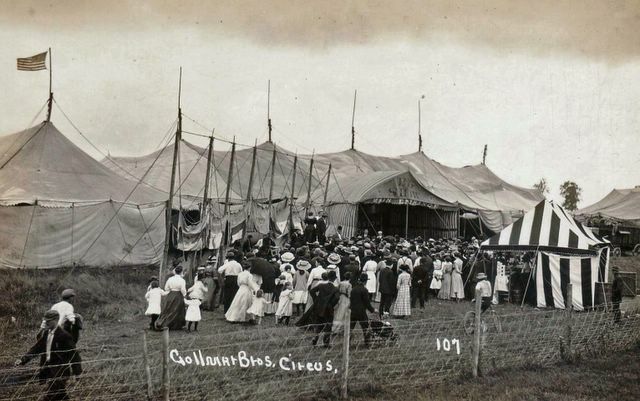 Starting out by using circus equipment their very successful cousins handed down to them, the Gollmars established one of America's major circuses in their own right but with the advent of World War I, sold their show following the 1916 season. 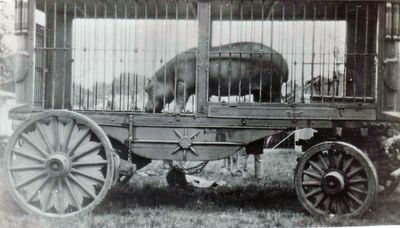 This Pit Show has been spotted down town and exhibits "The Strangest Animal on Earth" a wart hog. Despite what looks to be a pretty chilly day and with these marvels at hand, the young man at right disregards the need for shoes. A rainy, windy, overcast day with the Gollmar Show. The side show banners are at half mast while a "bally" is in progress. The side show top at left, the menagerie is in the background and the big top off to the right. 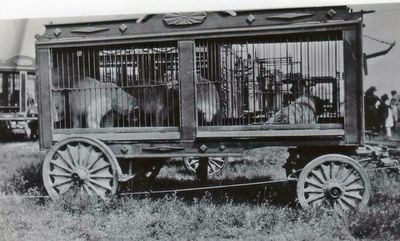 This is a classic picure of an elephant spotting cages in the menagerie. It might be the sea lion den since it is well covered and appears it will not be included in the parade. Notice that the doorway has been heightened with quarter poles to allow for more clearance. Tail end of the parade elephants, camels and steam calliope. There are more pictures in this well circulated set, I have over a dozen. "Glamorous DOLLY JACOBS presents beauty, grace and aerial equipoise in the 109th Edition of Ringling Bros. and Barnum & Bailey Circus." From the John Goodall collection of Ringling Press Photos. 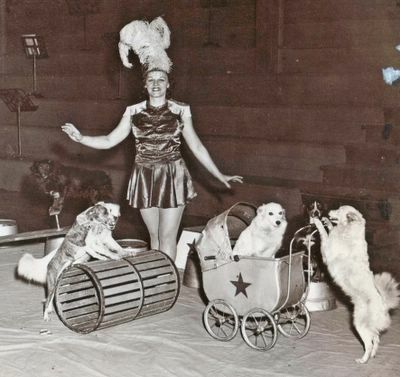 "Lovely DOLLY JACOBS, winner of two special awards at the International Circus Festival of Monte Carlo, performs on the Roman rings in the 109th Edition of Ringling Bros. and Barnum & Bailey Circus." 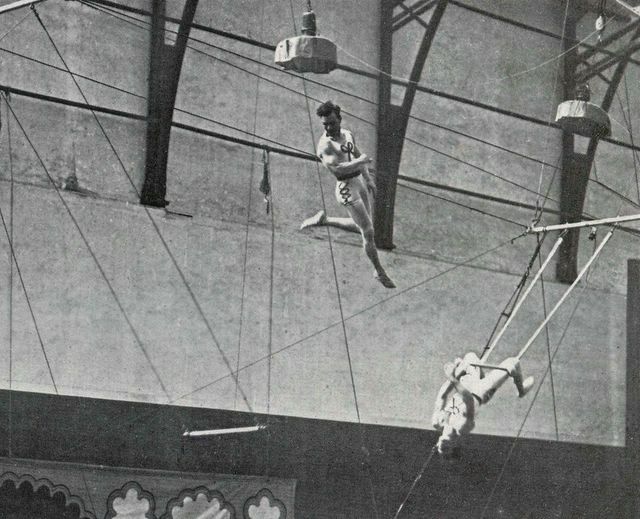 "Professor of the Air: ANTOINETTE CONCELLO, world-famous aerial director of Ringling Bros. and Barnum & Bailey Circus, shows pretty Paula Cleveland "the ropes". Manager...........................................................................Capt. 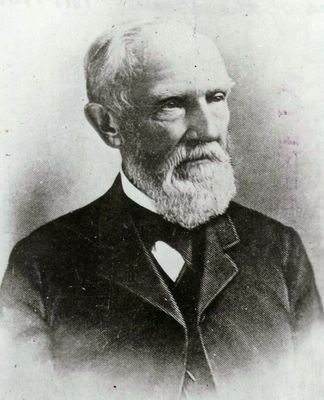 J. Russell Pickering M.B.E. Box Office Manager.........................................................Lt.-Col. A. F. Gleeson O.B.E. The public are warned to only buy tickets for the circus at the BOX OFFICE, OLYMPIA or from the RECOGNISED AGENCIES AND LIBRARIES. Do not buy tickets from men or women around or near the entrances to Olympia. Buy only at Box Office windows. Captain Alfred was originally a professional runner and in 1900 won the championship of Germany, which he held for three years. 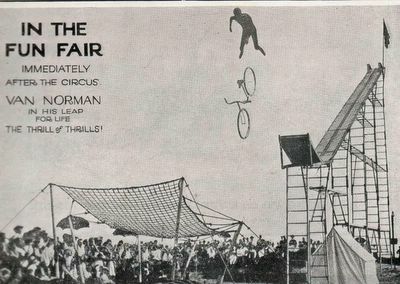 In 1904 he launched a sensational bicycle act, the success of which, inspired a desire for a more thrilling show and so he did the same act, a leap through space on a bicycle, enveloped in flames which he styled "The Human Arrow". 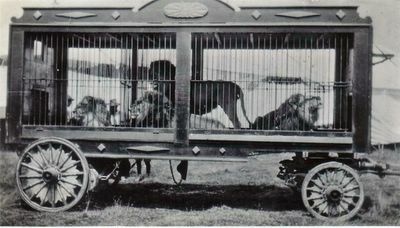 For years he had cherished the idea to become a wild animal trainer and whilst in Liverpool he heard of the coming of a steamer carrying six newly captured lions. So soon as the boat docked he approached the owner and bought the lions for 1,500 Pounds. 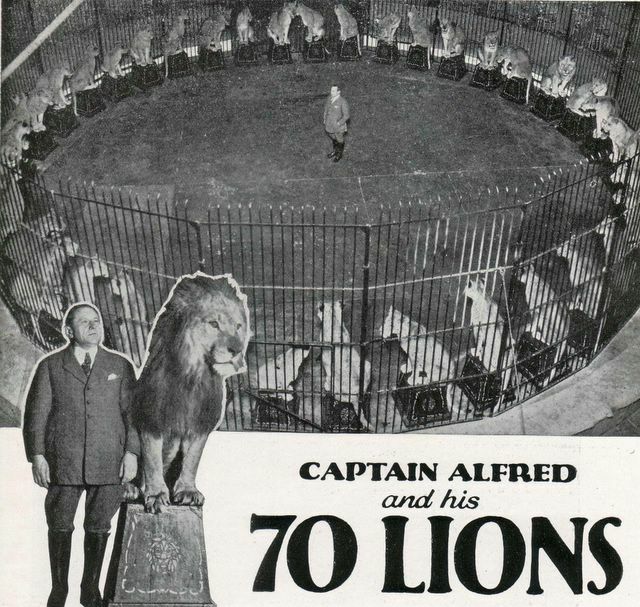 "A few months later I bought another group of six lions. My ambition was realised, I had found my way. I now own seventy lions; and since those early days I have been a breeder, a trainer and a dealer in lions. 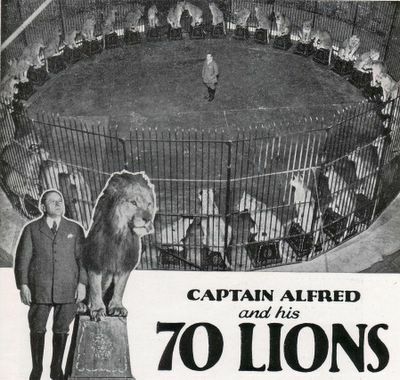 In all, I have handled over 200 lions." 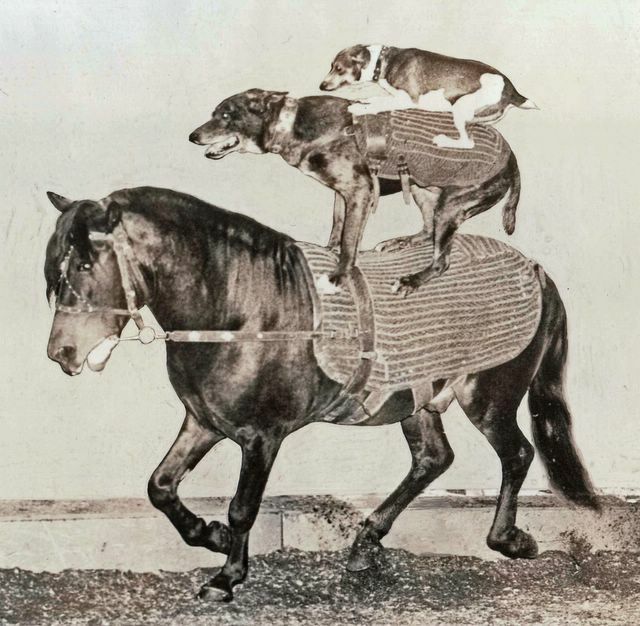 "The Wirth Family of Australian Riders, especially imported by Bertram W. Mills." Many of our Colonial visitors will have happy reccollectons of the Wirth Brothers Circus and those of our Patrons who have not had the good fortune to encounter this concern will be grateful to it for producing "The Wirth amily". Philo, the comedian of the Act, is not a Wirth. He is of the St. Leons, also of Australia. Stella Wirth, his wife, is a distinguished musician and has passed all the examinations at Monte St. Angelo College, Sydney, of which Institution she holds cap, gown and hood. 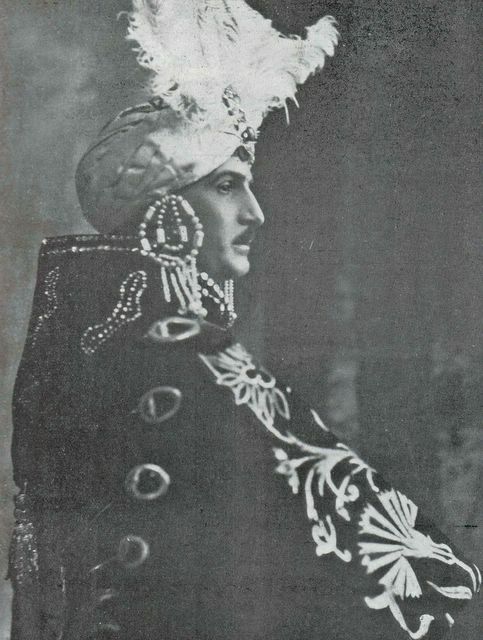 "Signor Truzzi, the Famous Italian Horse Trainer, who makes his first British appearance under the management of Bertram W. Mills." 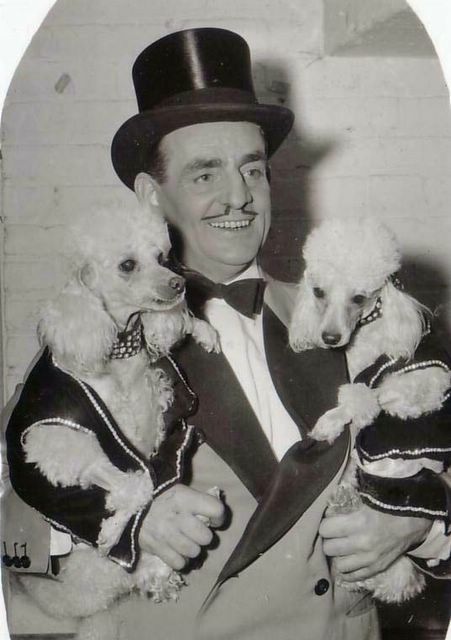 Signor William Franconi Trussi is the son of the late Gigetto Franconi Trussi, the famous circus proprietor of Ancona, Italy. Signor Trussi works on lines entirely different to other horse trainers and is the first to effect a blending of the ballet with equestrianism. All his equines are stallions; his number entitled "The Wild Horses" is said to be as thrilling as an average "wild animal" turn. 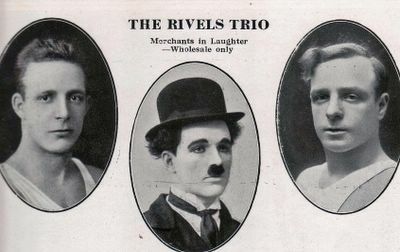 "The Andreus and the Rivels trio are of the same family.The Andreus are acrobats, the Rivels present what is known as the Charlie Chaplin trapeze act, which was the laughing hit of Bertram W. Mills 1924-25 season. The Charlie Chaplin act just happened by chance. Charlie Rivels saw a Chaplin picture and the same night, without a word to anyone, made himself up as the screen star, much to the annoyance of the family. However he stuck to his idea and devoted all his time to perfecting the impersonation. Eventually, in Madrid, his efforts were crowned with success and for months he was "The subject of all the Town's talk." "A remarkable photo of Alfredo Codona in the process of flight." The Flying Codonas come of three generations of acrobats. 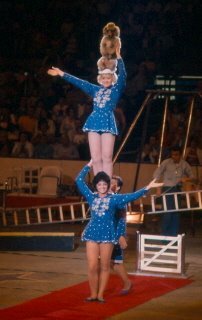 Their father was a trapezist who became a circus proprietor in Mexico. 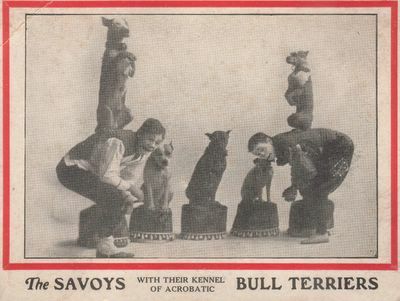 The present trio started their training at the age of four and by dint of years of unremitting practice have come to be unanimously regarded as the greatest aerial artistes the world has ever seen. Their work has taken them three times round the world and they have appeared in practically every country. 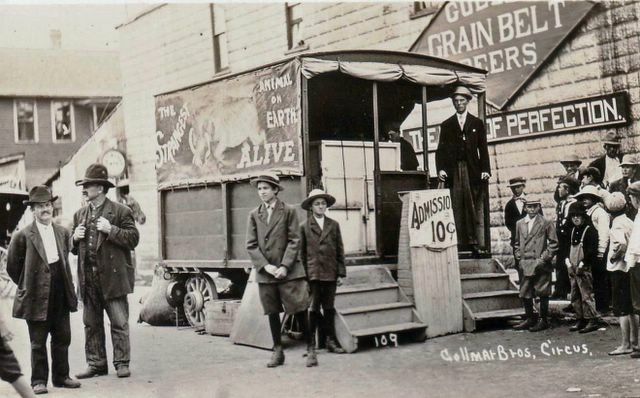 For five years they were a star attraction with the Ringling Bros.- Barnum & Bailey Greatest Show on Earth. These pictures are quite timely since the Catskill Game Farm will close it's doors forever in a few days. 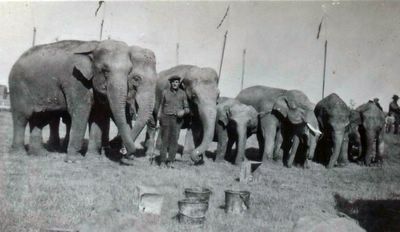 I provided them with elephants for five or six summers but today we see Al and Joyce Vidbel and Rex and Ava Williams. 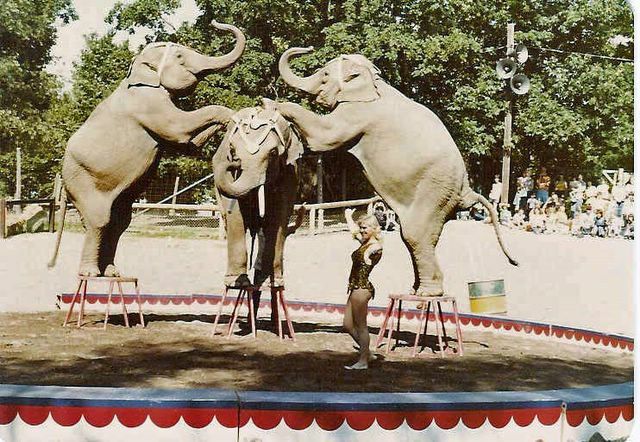 As I recall, Rex was the first person to provide performing elephants and elephant rides at Catskill. At first they simply set up a ring curb and the people just stood around. 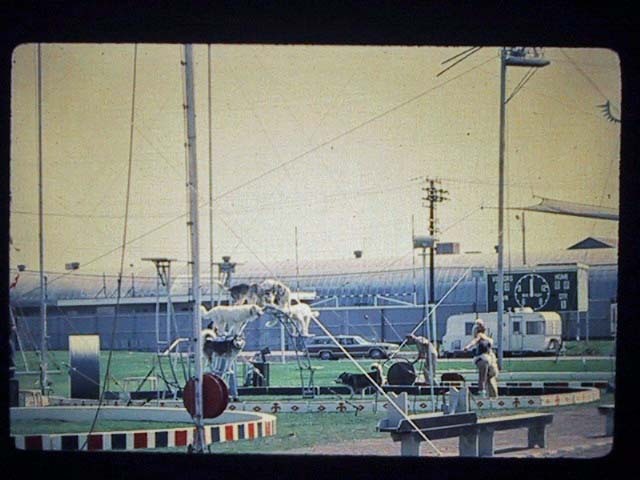 This proved so successful tho, that a grandstand and permanent, shaded ring was eventually built. Rex and Ava Williams with "Gardner", "Reed" and "Gyp". "Reed" giving the children the thrill of a life time. 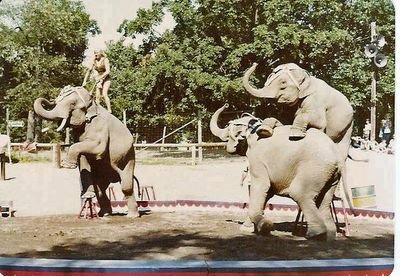 We used to walk the elephants to a huge boulder about a hundred feet away which we circled and returned to the loading platform. To the complaintants who stated that the ride was too short, I always politely pointed out that it was the novelty of having ridden a living elephant, those wishing to travel a vast distance should call a Taxi Cab. 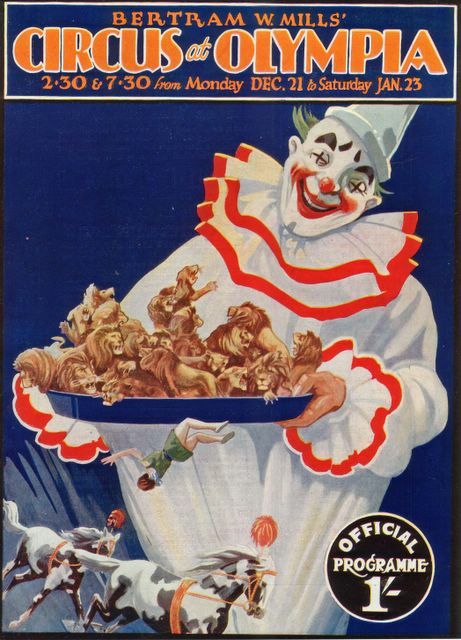 One of the Great American Circus Owners. Two showmen pay their respects. 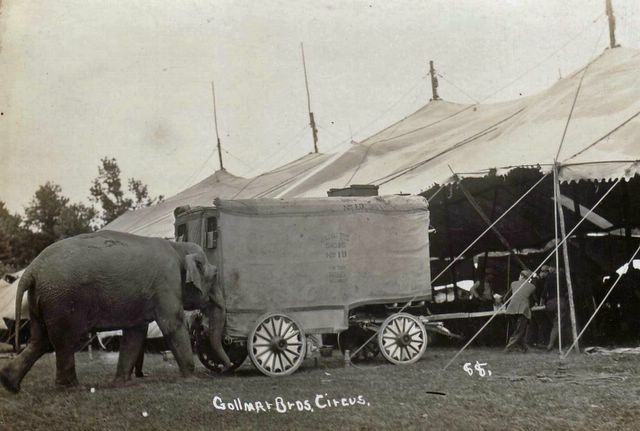 In 1922 the American Circus Corporation had four circuses on tour, Gollmar Bros. was the smallest, being moved on 25 cars and managed by Danny Odom. The year before it had been called "Howes Great London Circus" but this season the "Gollmar" title was leased. Today we see pictures of several of the menagerie dens, they were all similar in structure and made a nice appearance on the lot and in parade. Looking at this polar bear den reminds me that I had a chat with John Herriott yesterday and the subject of Ursula came up. 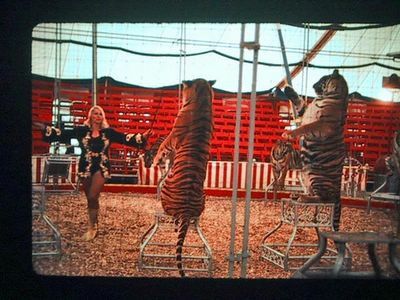 He said that at the Ringling Park he found her to be anything but an extrovert. Every morning he would greet her with "Good Morning Ursula, how are things today?" and she would always answer "50/50". Sometimes he would follow up with "It's going to be a beautiful day in sunny Florida, don't you think maybe 70/30?" and in departing, she would repeat "50/50". Maybe Richard Reynolds can give us the background on this young hippo "Victor". This is a well circulated picture of "Victor" including clown Abe Goldstein and a teen-aged Clyde Beatty at right who had joined the show the previous year. 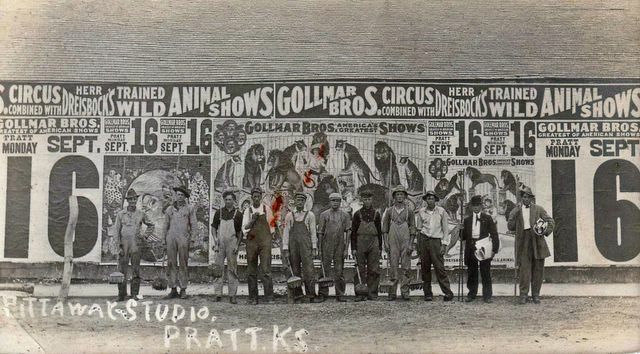 My father wrote the information on the back of this picture, identifying Joe Metcalfe as the elephant man and the three large elephants "Lockhart Nellie", "Barnum Alice", "Lizzie" and the male "Toto" who were purchased when the show was first framed in 1920. The three punks on the right are "Babe", "Katie" and "Mary" added in 1921 from Fred Buchanan's "Yankee Robinson Circus" (Mary was the elephant some of us saw at Gee Gee's Birthday Party in a film taken twelve years later, doing the head carry with Matt Laurish). However my dad missed the little elephant in the center, collared to "Toto". The only explanation I can come up with is that the Corporation purchased 12 punks in mid-season that year and "Danny", "Pearl", "Jewel", "Judy" and "Modoc" were added. Yes the same "Modoc" that eventually made her way to Ralph Helfer and was destined to become something of a cult figure due to an imaginary tale of an unrecorded ship wreck. 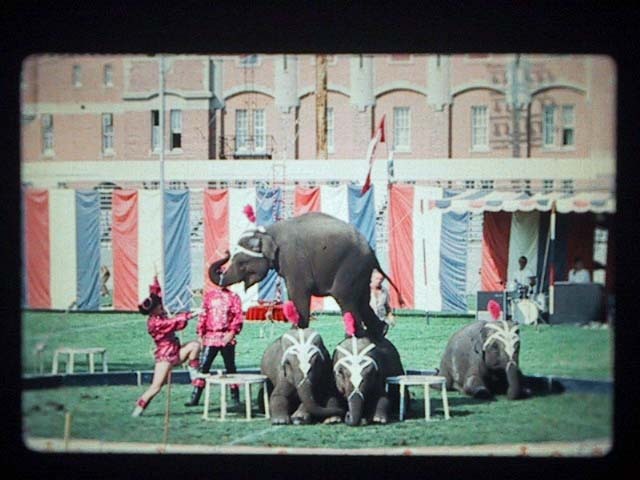 Article: "Ringling's reinvention of itself leads to circus of the bores"
Here is an article Henry D sent to me . . . . .
OLD-TIMERS are calling it "The Emptiest Show on Earth." You expect old-timers to be crotchety and resistant to change, but you know what? They have a point. 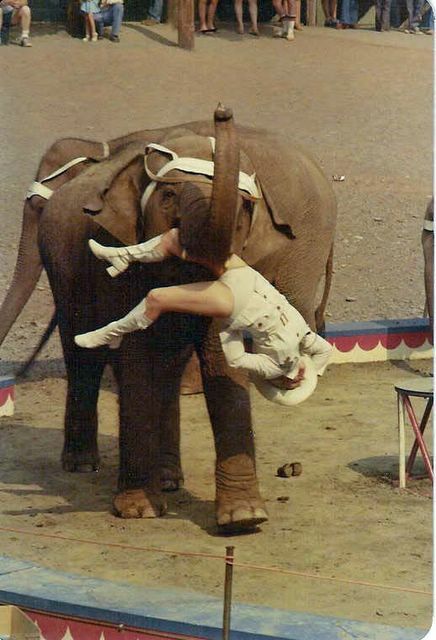 The newly reinvented Ringling Bros. and Barnum & Bailey Circus attempts some major changes, and most of those changes are pretty lame if your age happens to be outside preschool range. The 136th edition of what bills itself as "The Greatest Show on Earth" opened Thursday and closed Saturday at the Oakland Arena. 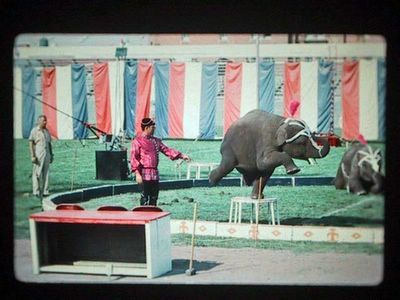 The circus heads to San Jose Wednesday and runs there through Aug. 27. Bypassing San Francisco's Cow Palace this year, the circus' last Bay Area stop is Stockton, Aug. 31 through Sept. 3. In "The Lord of the Rings," all the Hobbits and wizards and such jabber nonstop about "one ring to rule them all." The Ringling folks have taken that philosophy to heart. The classic three-ring circus is, at least for now, a thing of the past. 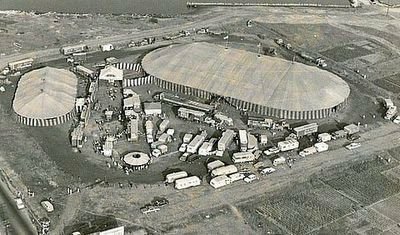 This is a one-ring circus, which means the action now covers most of the arena floor. It's funny, but you don't realize how much you miss three rings until you're forced to watch a one-ring circus for two-plus hours. With three rings, there's never time to get bored by the acts because your attention is always shifting in an effort to catch every little thing. I have been enthralled by your Blog – I found it by “accident” the other day and unfortunately have not gotten any work done, since!! Let me take you back, I mean WAY back to the summer of 1974. 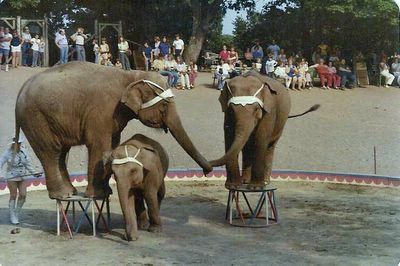 You hired a “GIRL” for the elephant crew at RBB&B Circus World Showcase – A sheer act of desperation, since you were short handed and the guys hadn’t had a day off in weeks. Well, that was me! 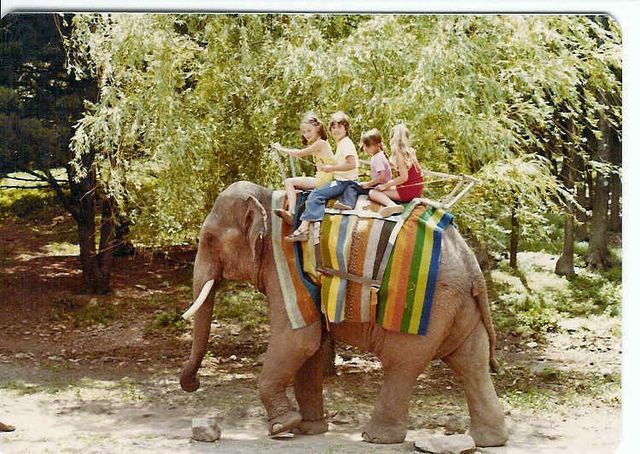 I was Cindy Weidley at the time and absolutely enamored by the elephants (Always have been)! I remember Chappy Fox in the elephant barn the first day I worked…he kept trying to get me to go to the Big Top and sell hot dogs...I told him I could do that kind of work at McDonalds! I worked pretty hard that summer! Scott Riddle was appalled that you stooped so low (to hire a GIRL). I learned sooo much from you and Barbara and still have awesome memories of that short “season.” I remember leaving because I had been offered a position in one of the (few) Dinner Theatres in Orlando, where I worked as a stage manager until 1977 when the Theatre closed. 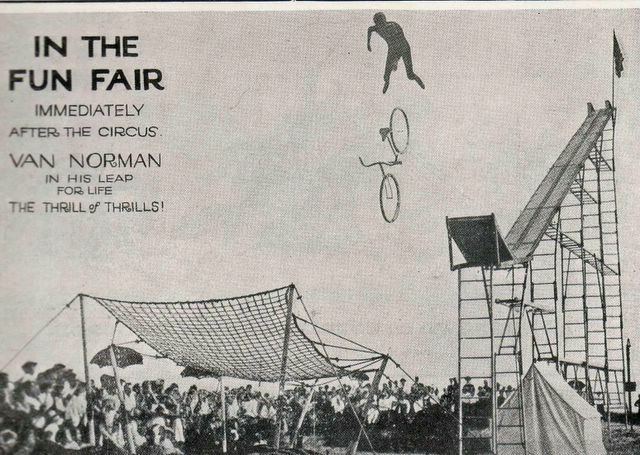 In January 1978 I was looking for a job and in the Classified I read “CIRCUS-SEE THE COUNTRY-MARKETING DIRECTORS WANTED-WILL TRAIN” So, of course I answered the call. To make a long story short (or maybe even longer!!!) I joined the Clyde Beatty-Cole Bros. Circus as a Marketing Director that season (1978). I worked for Tim Stinson (#%&$@#!). Well, he fired me that summer, Johnny Pugh hired me back, then fired Tim a year later! (what a shame…!) I worked two more seasons in advertising & billposting of all things, then married Dave Hoovers head cage man, Ned Potter. 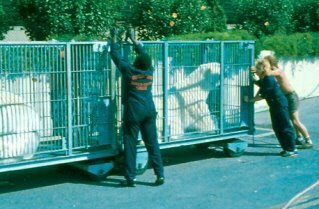 I worked with the big cats for two seasons (1981 & 82) living in the cat sleeper. 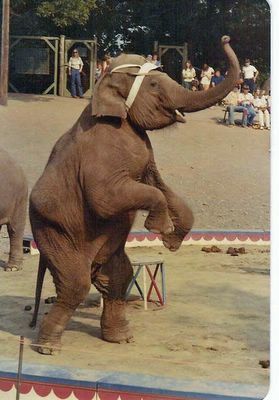 (I remember a story you told me once, about living in the elephant sleeper one winter – it was so cold that the water in the dog’s bowl froze and you & Barbara huddled under a great big fur coat!) I even did swinging ladders in the aerial ballet 150 pounds ago! My daughter Cassidy was born in New Orleans, LA – (a month early in Oct. 1983, or we would have been in Quarters!) and she saw 5 states by the time she was 3 weeks old! Ora Logan was her first babysitter! I worked in the show office as a ticket agent, administrative assistant, payroll bookkeeper, you name it… for the next few years, even driving show trucks when necessary to get them to the lot! Ned came down with Adult Onset Diabetes and it really took a toll on his health. He had worked his way up to prop boss and assistant manager, but in 1987 we had to “retire” from the show for his health reasons. I went back in 1998 & 1999 when one of the Marketing Directors was killed in a car accident, as a Marketing Director, again. I loved every minute of it! The Herriotts were our “next door neighbors” the first year I was on the show and I still say, I learned my “best shots” from Mary Ruth! They sure were a class act! I was crushed when I heard of Mary Ruth’s accident. My husband & I worked for Robert Baudy in the winter of 1980-81 (when the Beatty Show did their “indoor” fiasco) We went back on the show in ’81 for the regular season. Roger Smith and Larry Allen Dean were on the cat act that season, too. I hope you are all doing well. It’s interesting how people make an impact on your life. You and Barbara made such a great impact on mine, and I just don’t know how to tell you how much I appreciate those few months in the summer of 1974! 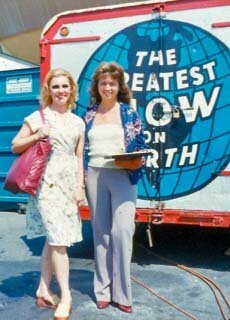 I still keep in contact with a few folks on the Beatty Show, and Heidi Herriott Koch lives here in West Orlando. We keep meaning to get together! Now, I am the Community Relations Manager for the ABC Network in Orlando – WFTV Channel 9) I manage the Community Program: WFTV 9 Family Connection. 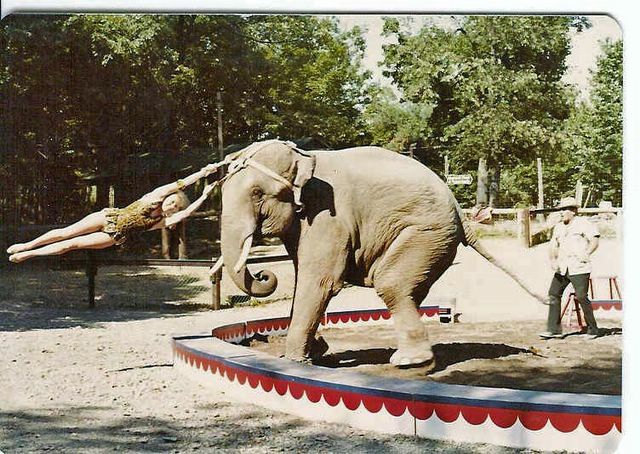 I still get an odd look from people when I tell them I was an elephant handler for Ringling Bros. 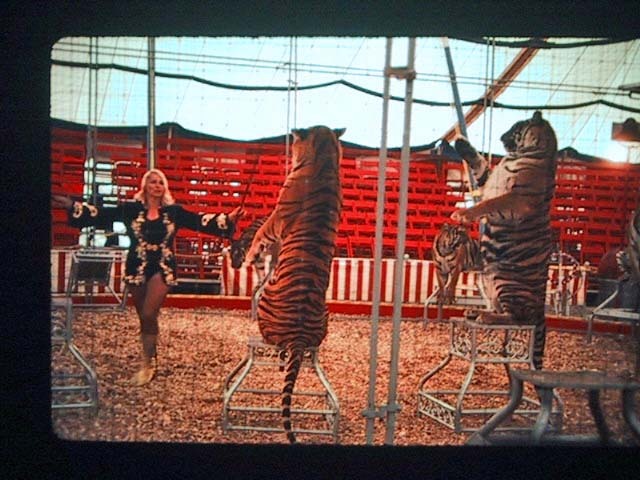 Circus one summer…it tends to lead to interesting conversation! I think you told me once that I was the FIRST girl in the History of the Ringling show to be an elephant handler, and I KNOW I was the first girl that Hoover hired on his cat act! (I used to smoke cigarettes that looked like little cigars to tease Hoover!) We just attended his funeral a few months ago. Lois looked great. She was always a rock. What I didn’t learn from Mary Ruth I got from Lois! They are good people! 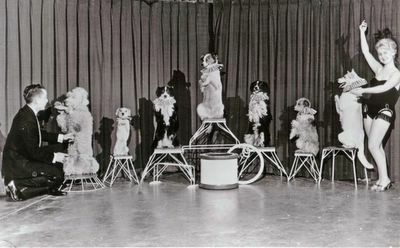 On the subject of dog acts, Eric sends this picture from the 1970 Blue Show. These Pit Bulls probably injured more people than the polar bears. Presented by Brownie Silverlake & Co. "Cute Canine Capers". 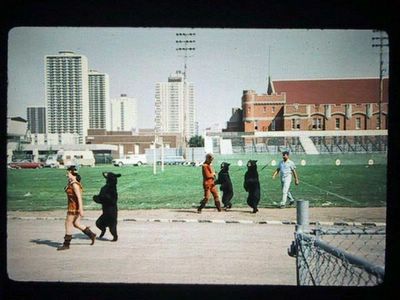 More bear pictures of the 1980 Blue Show from Eric Beheim. These show the Transportation Dept. 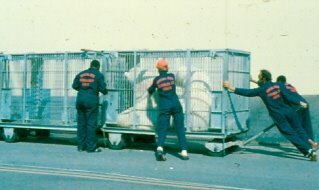 moving the shifting cages from their permanent area to the performing arena where the Prop Crew will take over. Here they are being spread apart so they can be reattached by the wagon poles.